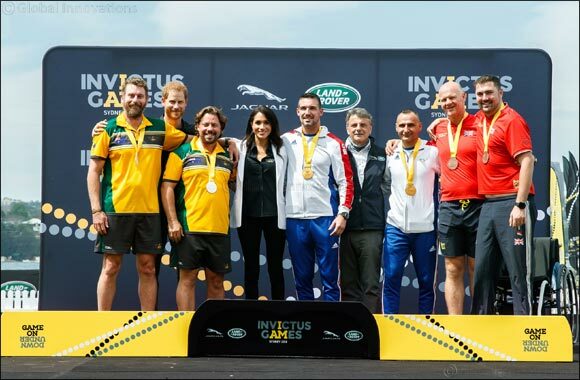 Dubai, United Arab Emirates, 22 October 2018 – The Invictus Games Sydney 2018 presented by Jaguar Land Rover got off to a flying start for France, as they were awarded the first gold medals of the Games by TRH The Duke and Duchess of Sussex. The France team, made up of Cedric Arci and Mickael Ranchin, took gold in the Jaguar Land Rover Driving Challenge, in which 12 nations went head-to-head in a test of driving and navigation skills. Watched by the Duke and Duchess of Sussex, teams comprising of a driver and navigator completed challenges in a Jaguar I-PACE. The brand’s first all-electric car was making its Australian debut. The challenges included driving through a water slalom obstacle, a precision driving test and a ‘smart cone’ course. With the two quickest teams qualifying for the gold medal showdown, it was France who came out on top, finishing faster than silver medallists Australia, who were represented by Craig McGrath and Scott Reynolds. After finishing with the third quickest time in the heats, the United Kingdom team of Mark Perkins and Daniel Bingley took bronze. And after being awarded the first gold medals of the Games by the event’s Founder and Patron of the Invictus Games Foundation, the France team could not hold back their delight.